your growth with comprehensive analyses and annual recommendations. Promotions to bring customers in! CUSTOMER LOCATION AND ALL AROUND! We’ve helped steer the marketing efforts of automobile dealerships for 20 years. It’s our passion and what we do best! RAID pioneered the private sales concept in Canada, the United States, South America and Europe. Since then thousands of dealers have seen their sales increase thanks to our Private Sales program, the most comprehensive in the industry. Analyzing your data bases to stay constant in touch with your clients. Launching advanced tools for new vehicle promotions. 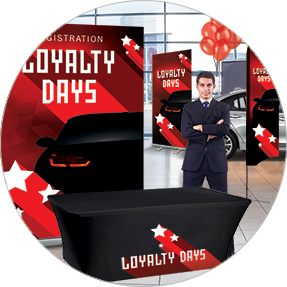 Creating 360 multi-dealer events for incredible sales results. RAID is constantly innovating for automobile dealers and manufacturers! Our goal: To develop, budget, create and manage a marketing plan that will bring more visitors to your dealership. We can help you turn your customers into ambassadors and create a unique brand experience. > What is the 360 Approach? Our sales managers are professionals with extensive experience in the automotive field. Our strategists and creatives focus on one thing and one thing only: increasing your sales. SAY THEY NEVER HEAR FROM THE SELLER AFTER TAKING POSSESSION OF A VEHICLE. AFTER TAKING POSSESSION OF A VEHICLE. We use qualified leads from among your leasing, financing and maintenance customers to book appointments for the Private Sale event. We next identify the customers within your territory who have the greatest potential and set up appointments with them. During the event, RAID’s Elite Event Managers are onsite working with your sales team. RAID has developed solutions for dealerships of all sizes and for many manufacturers nationwide.